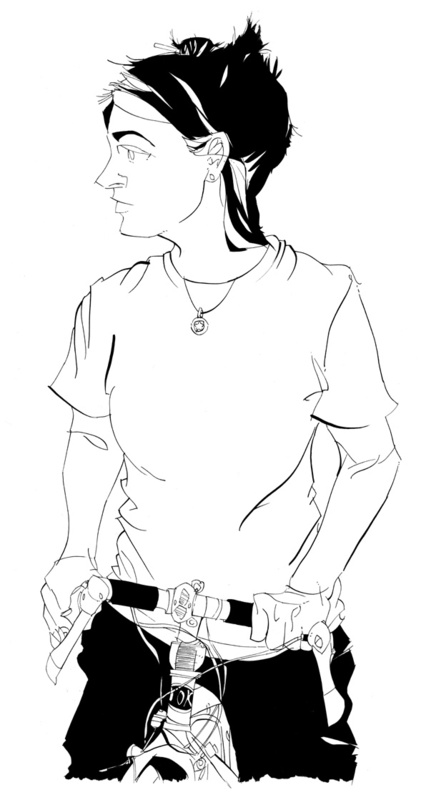 Steve Larder is my friend…and stuff….and things… and he draws pretty pictures. I'm thinking deep thoughts as I stare into the Wilamette River from the Steel bridge. he also did this one for our Zines on Toast tour last year. modeled off one of the many photos of me with whispy dramatic hair, when I had long hair. 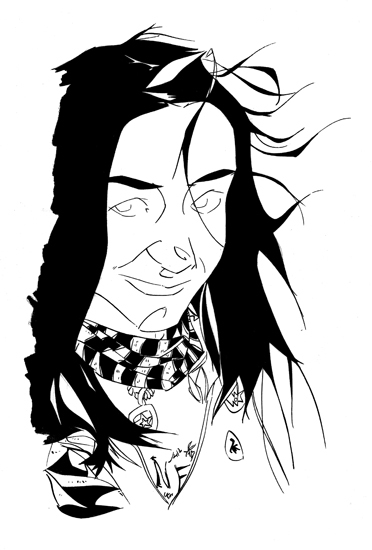 Anyway, Steve does a zine called Rum Lad is a really great friend and and excellent illustrator trying to make his way being and illustrator in Nottingham in the UK. You can check out his images that have been used in zines, on show fliers, albums and magazines here , follow his blog here or check out his guest blogging at Creative Nottingham here, here, here, and here. Steve was also the instigator for our zine band The Copy Scams. I’m not sure how he scammed us into starting a band in 3 weeks and then playing a show but it sure was fun! Paul just remixed our tape of four songs and I have the available on my Etsy site here. 4 lo-fi pop punk songs about zines! I also have about 5 copies of Brainscan 26.5 Nine Stories left! I put them up on my Etsy shop while supplies last! I need to head downtown because I have and IPRC shift tonight. Brainscan 25.5! 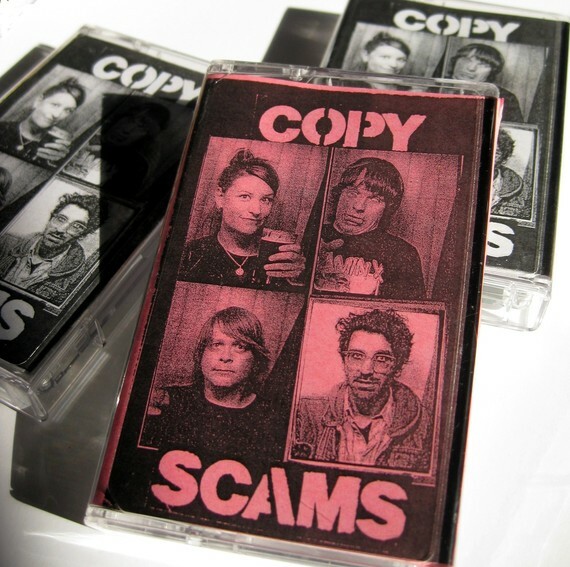 Copy Scams tapes! Up the analog zine punx! At the IPRC on July 11, 2010 the Portland Zine Symposium sponsored a 24 hour zine challenge. A 24 hour zine challenge is when you make a zine in 24 hours. Well, this is the zine I made that night. You are not supposed to have any idea what you will put in your zine before you start so I had no idea what would come out of this. What did come out of those 24 hours, besides sleep deprivation delirium, was some photocopier artwork and stories about all the post boxes I have ever had. The count is 4 and each was a distinct time in my life that I wrote about including the secret admirer who wrote love notes to my boyfriend I shared the post box with and stories about long lost penpals. 32 pages 1/8th legal with black covers hand stamped in silver. Also, I started a zine band! The band equivalent of a 24 hour zine! Steve of Rum Lad zine came to Portland from the UK for awhile and had the idea to start a band. I said “ok” and we got our housemates Paul and Marc to join in the fun! In 3 weeks we wrote 4 songs, practiced, recorded, and played a show that closed the 2010 Portland Zine Symposium! 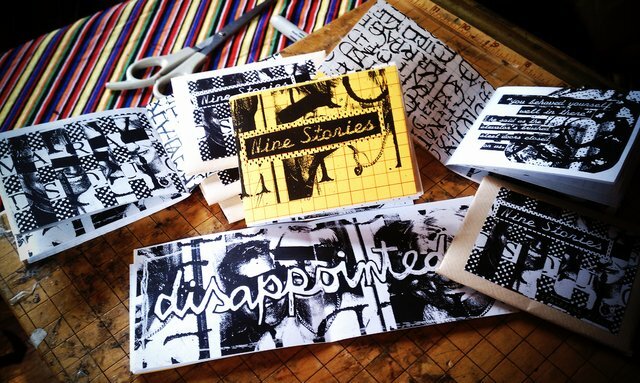 What resulted was this 6 track demo of 4 lo-fi pop-punk songs all about zines! We have an obligatory intro song filled with excuses as to why the band is so late, another song reads like a cliche zine article full of things we like and hate, a song about stealing photocopies, and a song about the 24 hour zine challenge. Cassette tape only! Up the analog zine punx! Comes with a 16 page 1/8 sized zine with lyrics and silly drawings. Greetings from my first IPRC shift in about a month and a half or more. I realized as I was taking the train downtown that this was the first time I had left my neighborhood since I have been home. This just goes to show how awesome my neighborhood is…or what a recluse I am. You pick. So far I have been catching up on button orders and trying to get my life in order. Paul and I cleaned both bathrooms, and cleaned and rearranged the dinning and the living rooms. We have lived in this house together for 3 years now and it was time to make some changes. We also snaked our toilet to find that there was a comb stuck in it. How did it get there? How long had it been there? Who knows! Now if I can just get to winterizing my yard! I have also been cooking lots and lots. i love my kitchen. I have made a vegan roast with gravy, lentil soup, pizza, roasted veggies, vegan sausages, shepard’s pie, spagbol band more (photos coming some day) I really just love cooking in my own kitchen after a month long tour of being in so many that weren’t mine where I always find myself playing the how-few-drawers can-I-pull-to-find-the-flatware game. I also enjoy drinking beer out of my own pint glasses. So, Monday October 18th is my 33 1/3 birthday! I will be 33.3 years old! I’m going to have a low key record listening party in the evening. I really should by a new needle for our record player first. So, if you are in Portland and would like to stop by and listen only to records that are at 33 1/3 rpms stop by with some snack and maybe a pumpkin to carve. Speaking of pumpkiny things. Paul and I have decided to go as Mulder and Scully from the X-files for Halloween. We talked years ago about doing but never have. We’ll need trench coats and I need a small gold cross as well as a pant suit and some badges. I cant’ decided if I should cut and dye my hair or if I should find a wig. I’m leaning towards wig because I like the blue and need to dye it again. I’ll also need someone to put makeup on me because I never learned to do any of that stuff. I’m currently at the IPRC and I need to go make some copies of my 24 hour zine, Brainscan 25.5 , to put them up in my Etys shop and do some distro stuff. I also need to make some more ziney inserts for the Copy Scams tape so I can get them up on my Etsy shop. Paul is supposed to make a digital version too. Details soon soon soon! The last 3 days of tour were spend in the excruciating humidity of New York City, but I still had a great time spending the last few days with friends who are now 8 time zones away. I can’t help myself from doing the maths from time to time. So, I’m back in Portland with a yard and garden that desperately needs my attention so I’ll have to attend to that. Jackie and OJ seem happy that I’m back. They were waiting at the gate for me… not the gate at the airport as someone suggested but at the back gate. Jackie also proceeded to sleep on my head being a great cat hat to show is appreciation. Yesterday Paul and I got burritos at my favorite (and conveniently located by my house) taco cart. Then we rode our bikes to do some grocery shopping. There was a perfect Portland misty rain and it made me really happy to be home. Maybe soon I’ll write more of an update about tour but for now I have a ridiculous amount of photos uploaded to facebook that you can check out here. Looking through them seems like the things happened so long ago. Good times! Right now I’m really into the autumn weather, cooking in my kitchen, listening to my new records, cleaning up my messy office and reclaiming my shipping table now that Steve has gone back to his tiny island and the office is no longer the Brain-Lad office. I have a new zine in my head and I’m going to make more of the Copy Scams tapes and put them up on Etsy. Somehow we went through 25 of them? I think I gave away 5 but still, 20 people paid money for our silly tape of 4 songs put together in 3 weeks? Rad! There is even talk of putting it out as a 7″. We’ll see what becomes of that. Does anyone have any neat Portland Zine Symposium trivia? I’m working on submitting something to the 10th Anniversary zine. You know, like the Portland Zine Symposium has been held in 4 different location on the PSU campus and how the 2006 Portland Zine Symposium ruined 3 relationships (that we know of!) Any more to add? We are scheduling a Zinester Feud at Floating World Comics after the symposium on Saturday. Is is based on the game Family Feud (or Family Fortunes for our UK friends) For this to work we need to compile survey answers from you , the zine public. So, even if you can’t make it to the Portland Zine Symposium you can influence it! Please go here and fill out the survey. We are also going to try to stream it like we did with with the 24 hour zine challenge! So, the band that we have started since Steve has been in town has a show! On Sunday August 29th after the Portland Zine Symposium! You should come! We are also working on a 4 track recording to be released only on cassette! 5 songs about getting caught stealing copies, lists of things we like/dislike, the 24 hour zine challenge and more! After that, I head out for the Zines On Toast tour! notes fron Denver and my zine concept band! Speaking of bands… I started a band with Steve while he’s in town! We are called The Copy Scams. Steve plays guitar, Marc played bass, Paul played drums, and I sing. It’s a zine themed band and we hope to play a show before the symposium. We have one song down and the skeletons of two more. We’re hoping for a 5 song concept set. The songs are all about zines. The first song is the intro song that is all about excuses for why the zines/band is so late. I also have lyrics about the 24 hour zine challege, and getting caught stealing copies from Kinko’s! Steve and I are talking about making a 4 track recording and only selling them on tape! Ok, off to try some more yummy vegan food in Denver!